Barcelona (AFP) – The speaker of the Catalan parliament on Monday proposed the region’s ousted leader Carles Puigdemont as president of Catalonia, as Spanish prosecutors sought a European warrant for his arrest. Roger Torrent said Puigdemont’s candidacy to once again head Catalonia’s regional government is “absolutely legitimate”, even though the secessionist leader faces criminal proceedings over his role in Catalonia’s independence drive. In a major blow to the central government in Madrid, separatist parties once again won an absolute majority in the Catalan regional parliament in a snap election in December. Puigdemont wants to be invested from Belgium, where he fled in late October after the Catalan parliament voted to declare independence. He now faces arrest if he returns to Catalonia over his role in the independence drive. The Madrid government has ruled out his being allowed to rule from outside the country and even his separatist allies — the leftwing ERC party of Puigdemont’s former deputy Oriol Junqueras — are cool in private to his bid to rule from abroad. Spanish prosecutors on Monday sought a European arrest warrant for Puigdemont as he arrived in Copenhagen in his first trip outside of Belgium since he fled to the country. The prosecution service asked Supreme Court Judge Pablo Llarena to re-issue an arrest warrant for the secessionist leader, sacked by Madrid after the Catalan parliament declared independence, and urge Denmark to hand him over, a judicial source said. Llarena had dropped a European arrest warrant for Puigdemont and four of his deputies who fled to Belgium in early December, saying it would complicate the overall probe into the region’s leaders — but warned they would be arrested if they return. He is not obliged to agree to the request to re-issue the warrant. Puigdemont and the rest of his ousted government have been charged with rebellion, sedition and misuse of public funds over their separatist push. Danish broadcaster TV2 released an image on its website of Puigdemont being surrounded by reporters after his plane landed in Copenhagen Airport. 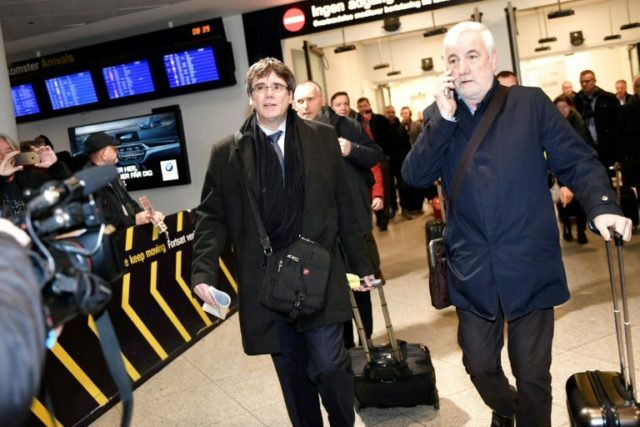 On his Twitter feed, Puigdemont confirmed his arrival in the Danish capital, where he is due to take part in a debate at the University of Copenhagen about the secession crisis in the region later on Monday. Three other separatist lawmakers are already in custody in Spain over their role in Catalonia’s separatist push, including Junqueras, his former deputy. The Catalan parliament’s legal experts have said that any presidential contender has to be physically present, but Puigdemont insists he has the legitimate mandate of the people to rule. Spanish Prime Minister Mariano Rajoy reiterated Saturday that governing Catalonia from abroad would be “illegal” and has warned Madrid would maintain its direct control over the region and will take the matter to court if Puigdemont sought remote rule. Catalonia’s separatist push has sparked Spain’s biggest constitutional crisis since the country returned to democracy following the death of longtime dictator Francisco Franco in 1975 and has deeply worried the country’s EU partners. Having been in Belgium for three months without a residence permit, he would also have to leave, albeit briefly, to conform with EU residence laws.